This studio room at the Hilton Club New York offers the finest in luxury and simple accommodations. 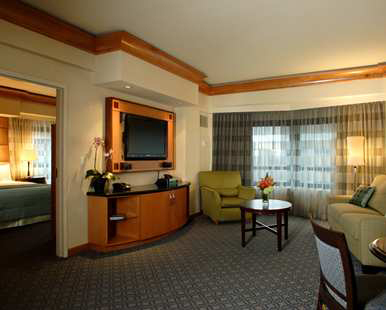 Our spacious room has a king-sized bed and features a 42-inch plasma TV. Our bathroom offers a therapeutic Kohler shower with multiple heads and spa-quality bath amenities. We will enjoy complimentary WiFi access and will take advantage of the Club Lounge, offering a complimentary Continental Breakfast or indulge in complimentary snacks and drinks from 12-7 pm. We may even make an appearance at the Nightly Manager’s Reception offering complimentary beverages and hors d’oeuvres from 5-7 pm. Our one-bedroom suite at the Hilton Club New York offers us 660 square feet of pure luxury. Our beautiful room offers one king-sized bed, one queen sofa bed and a spacious living room with a breakfast area. Our bathroom offers us a luxurious Roman soaking tub, a separate therapeutic Kohler shower with multiple heads and spa-quality bath amenities. For our entertainment, we will enjoy a 42-inch plasma TV in the living room, and to stay connected while traveling we will utilize the complimentary WiFi. We will visit the Club Lounge offering complimentary food and beverages throughout the day. 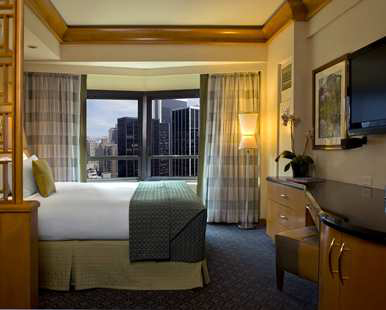 We will step into luxurious comfort with a two-bedroom suite at the Hilton Club New York. Our 840 square foot suite offers two king-sized beds, one queen sofa bed and a spacious living room with a breakfast area. The suite has two bathrooms – one with a luxurious Roman soaking tub and a separate therapeutic Kohler shower with multiple heads, the other with the therapeutic shower. Both bathrooms offer spa-quality bath amenities. For our entertainment, the living room has a 42-inch plasma TV and additional TVs in each room. To help us stay connected while traveling, complimentary WiFi is available in the suite. The romance of Manhattan’s Seven Bridges is exemplified in this unique bar. Stunning murals of New York City’s bridges and steel cables accent Bridges Bar, providing sophisticated surroundings to enjoy a cocktail at either the oversized bar or the oversized banquettes. We will enjoy martinis…they have the best in town! Conveniently located off the lobby of the New York Hilton Midtown, we will enjoy ourselves late into the night. We will enjoy Hilton’s new concept restaurant—Herb N’ Kitchen—featuring seasonal salads, artisanal sandwiches and brick oven pizzas. A barista zone will prepare specialty coffees for us to enjoy either in the restaurant or on the go, while a breakfast buffet is served daily. Overlooking the lobby of the New York Hilton Midtown, the Lobby Lounge is the perfect place to relax with faces from around the world. We will enjoy our favorite wine, cocktails and lite fare before we head out to see all that this amazing city has to offer. Minus5 is an ice bar where we can touch, feel and explore handcrafted ice sculptures and ice architecture made from Canadian ice. Everything inside Minus5 is made of ice, even the glasses that we will enjoy the famous vodka-based cocktails in. We will be treated to the coolest experience in town! Thanks to your wonderful wedding gift, we will relax into the ideal romantic honeymoon destination of New York City! We will admire the amazing city views of mid-town Manhattan, offering an idyllic destination for a truly unforgettable trip! With spacious accommodations and an ideal mid-town Manhattan location, Hilton Club New York allows us to make our Honeymoon memorable. This resort credit will truly enhance our intimate escape to the Big Apple. 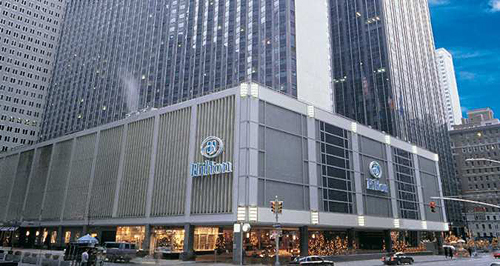 Located in midtown Manhattan, Hilton Club New York promises us a romantic honeymoon getaway! With your thoughtful gift, we will enjoy countless activities, take comfort in luxurious accommodations, and take advantage of the proximity to world-class shopping, dining, and entertainment. We will explore the Big Apple and all it has to offer including Fifth Avenue, Rockefeller Center, Broadway, Theater District, Central Park, Radio City Music Hall or Lincoln Center. 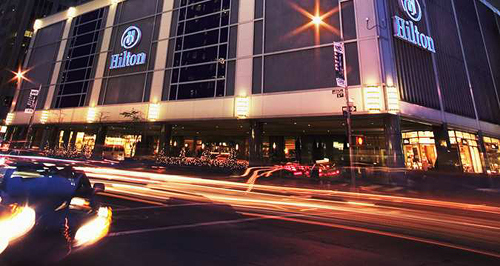 We will luxuriate in an array of pampering amenities at the beautifully designed Hilton Club New York!